Find out more about the discontinuation of Capital One Direct Connect service and what you need to do to ensure continued service. Direct Connect service has been discontinued by Capital One since December 2017 and made some modifications to the replacement Express Web Connect, effective June 18, 2018. To set up your bank feeds again after this date, you'd need to have the latest QuickBooks patch and updated Bank Feeds setting for continual use of Express Web Connect. Express Web Connect service has replaced Direct Connect and is available in QuickBooks 2016 and later. Note: The service is NOT available in QuickBooks for Mac. Direct Connect and all online banking services features such as Manage Bill Pay or Transfers are NO longer be supported in QuickBooks 2016 and later. This message appears when your QuickBooks is on the latest release and you still try to use Direct Connect features. Users of QuickBooks 2016 and later have to download and install the latest patch from the QuickBooks Download & Updates website. All users must switch from the discontinued Direct Connect, or interim Express Web Connect, to the newly offered Express Web Connect by following these steps. Make sure you are in the latest release for your version of QuickBooks. Make sure you are signed in to your QuickBooks My Company. From the Company menu, click My Company. In the My Company window, click Sign in. Enter your Intuit User Name and password. NOTE: If you do not have an Intuit account yet or if you do not remember setting up one, refer to Manage your Intuit Account online for guidance. If you’ve used online banking services such as bill payment, delete pending online payments or checks. Add and match previously downloaded transactions. For detailed steps, refer to Add and match Bank Feed transactions. Right-click the account that needs to be deactivated then click Edit Account. Go to the Bank Feed Settings tab. Click Deactivate All Online Services. Click OK when you get a confirmation that you have just disabled one or more online services for the account but it does not cancel the services with the bank. From the QuickBooks Banking menu, choose Bank Feeds > Set Up Bank Feed for an Account. In the Enter your Bank’s name field, type in Capital One Bank - New. Note that as you type, QuickBooks displays names that match what you've typed so far. If you are presented with a message indicating to please login from My Company sign in, please ensure that you have completed step 1d before starting this step. Enter your Online Banking ID and Password then click Connect. QuickBooks will connect to the bank’s server. Select the account(s) you want to connect to QuickBooks and click Connect. Click Close after the 'Success!' screen opens. Your account has been successfully added to QuickBooks. From the QuickBooks Banking menu, click Bank Feeds > Bank Feeds Center. From the Bank Accounts list, choose the account you need to download for. Click the Download Transactions button if you are ready to receive transactions. Once the transactions have completed downloading, click Transaction List to process the transactions as normal. You’re signed in with a different Intuit ID than the one used to set up this account. Resolution: Go to Company > My Company and sign out. Sign in with the Intuit ID used to set up the feed to download transactions. QuickBooks doesn’t have permission to download account data. Resolution: Deactivate this feed and set it up again. Your access to this feed is deactivated. You have either removed access to this account via your bank or using this account with another QuickBooks company file. 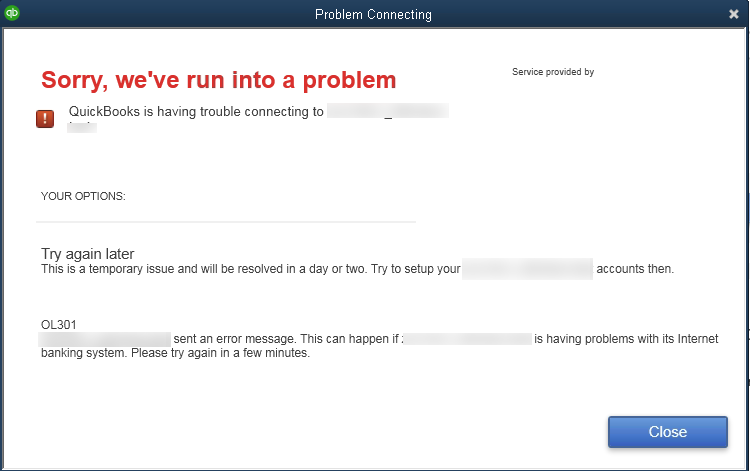 This error indicates that there’s an issue with the saved login credentials for your Intuit User ID. This can be fixed with a quick extra step. Go to Help > Reset Intuit ID settings. A prompt will appear to warn you that you will be signed out of any apps if you proceed. Type YES in the text field and OK.
Go to Company > My Company. Click the Sign in link at the top right of this window. Sign in using your Intuit website credentials (not your company file credentials). If you don’t have an Intuit login yet, you can click the Create an account button to make one instead. Once you are signed back in, try connecting to Capital One again. 88888 No FI accounts found for given credentials. Please try with a different credentials. This error indicates that there is no financial institution associated with the account. Resolution: Deactivate all online services and reset Intuit ID settings. If that doesn’t work, you may try to Resolve Data Damage on your company file or Fix your damaged company file or network.